From the beginning, reintroducing rail into a region dominated and dependent on the car has been a daunting task. 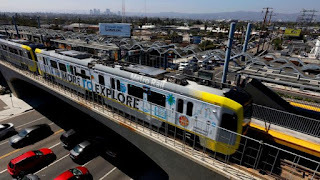 Officials have spent billions of dollars to build more than 100 miles of passenger rail to connect the far-flung edges of Los Angeles County, from Azusa to Santa Monica, and North Hollywood to Long Beach. 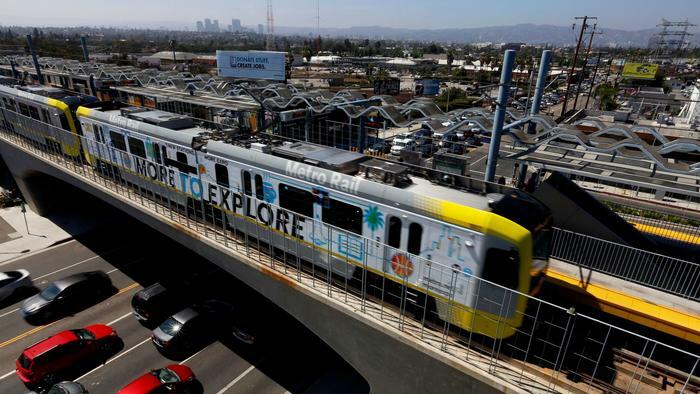 The Metropolitan Transportation Authority’s newest rail line, between downtown Los Angeles and the Westside, is packed with riders. But swaying Southern California’s allegiance to the car has proved difficult. Ridership has faltered on Metro’s expansive bus system, and the vast majority of the region’s commuters continue to drive alone to work. Next week, voters will decide whether to redouble the county’s transit building boom through Measure M, a half-cent sales tax increase to nearly double the length of the rail network. Adding more rapid transit will add options for commuters, experts say, but they stress that rail alone won’t solve L.A.’s infamous congestion. Rather than a total reliance on transit, Southern California’s growth will probably follow a “hybrid approach” to mobility, incorporating rail, buses, walking and biking, shared mobility services such as Uber and Lyft — and, yes, cars. Moreover, they say, the county’s 88 cities will have to welcome taller commercial and residential developments along major boulevards and within walking distance of transit lines to encourage drivers to get out from behind the wheel. Metro Chief Executive Officer Phil Washington has said he hopes to convert 20% to 25% of the county's population into regular transit riders, more than three times the current rate. The nearly $42 billion that Measure M would set aside for new rail and bus rapid transit construction could help achieve that goal, proponents say, and will provide more options for commuters as traffic gets worse. But to meet that ambitious shift toward transit, Southern California would have to add more apartments and offices along major arteries and near transit, making it easier for people to move through the region without driving, said Lisa Schweitzer, an assistant professor of urban planning at USC. To be most effective, Measure M investments should be coupled with policies that discourage driving, said Juan Matute, associate director of the UCLA Lewis Center and Institute of Transportation Studies. Those could include raising the gas tax, tolling certain routes or areas, or charging more for parking. Measure M would raise the county’s base sales tax rate by a half-cent, to 9.5%, and would indefinitely extend an existing half-cent tax that will otherwise expire in 2039. The levy would raise an estimated $120 billion over the first four decades. Critics of Measure M have said that the tax’s no-sunset clause makes it difficult for voters to hold Metro accountable, particularly if the projects face cost overruns or schedule delays during construction. But even skeptics acknowledge that there are few viable options other than adding more mass transit as L.A. tries to tame traffic and deal with population growth. Congestion in 2057 will be 15% lower than it otherwise would be if Measure M passes, Metro researchers say. If Measure M misses the required two-thirds majority, always a high hurdle, Metro will continue to receive more than $2.5 billion in revenue annually from three other half-cent sales taxes. Construction will continue on rail lines underway through downtown, the Miracle Mile and South Los Angeles. But officials would not have new revenue to borrow against to build new rail lines faster, including a tunnel through the Sepulveda Pass, and extensions through the South Bay, the San Fernando Valley, the San Gabriel Valley and the southeast county. The measure would also accelerate construction on the Purple Line subway from Century City to Westwood by more than a decade. Some arteries, including Vermont Avenue, would see the arrival of so-called bus rapid transit, which can include platforms, bus-only lanes, fewer stops and other rail-like features. Vermont has been a candidate for rail since officials considered building the first modern rail line in Los Angeles. Riders on buses along the congested north-south corridor make about 45,000 trips per day, more than some Metro rail lines. The bus rapid transit project is slated to debut between 2028 and 2031. If ridership is high enough, the line could be converted to a subway after 2060.